This story was submitted by Harker rising junior Cindy Liu. 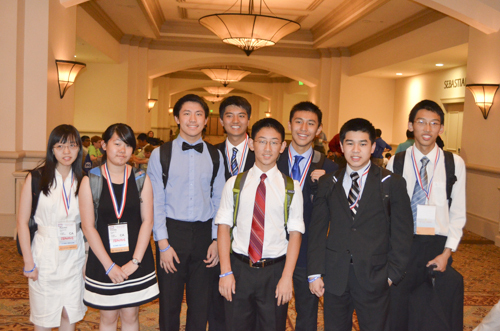 On July 2, a team of eight Harker rising juniors placed first in the nation in the 9/10 division for the 2013 Tests of Engineering Aptitude, Mathematics and Science (TEAMS). The competition took place during the national Technology Student Association (TSA) conference held from June 28 to July 2 in Orlando, Fla. The team members included Andrew Jin, David Lin, Cindy Liu, Steven Wang, Rachel Wu, Stanley Xie, Leo Yu and Andrew Zhang. TEAMS is an annual science, technology, engineering and mathematics competition challenging students to work collaboratively and apply their math and science knowledge and problem-solving skills in practical, creative ways to solve real world engineering challenges. The 2013 TEAMS theme was “Engineering a Secure Cyberspace.” The first part of the competition, held locally in March, included 80 multiple choice questions and eight short essays on the theme. The team ranked number one in California in the grade 9/10 division and were invited to participate in second part of the competition at the national level. The part II test consisted of three categories: a research essay on cybersecurity, a written problem-solving exam with complex math, physics and computer science scenarios and an extemporaneous debate on one of three topics: social media, work place privacy and cloud computing. All of the students benefited from the knowledge they had accumulated in Harker classes, such as their math courses, AP Physics, AP Computer Science and the debate program. The TSA is a national organization that supports more than 60 STEM competitions for middle and high school students nationwide. TSA membership includes more than 190,000 students in 2,000 schools spanning 48 states. In addition to the TEAMS competition, students attended ceremonies recognizing TSA development and were able to meet with participants of other TSA projects. All of the participating teams qualified for the national round by placing in the first four places in their states.